Let's go over some of the items that will help shape the week that lies ahead on Wall Street. 1. Costco in the Club: Costco (COST) turned heads two weeks ago, when the warehouse club giant took on $3.5 billion in new debt so it could declare a special one-time $3 billion dividend. A lot of companies have been declaring meaty payouts that will go out to shareholders later this month. Qualified dividend tax rates that are currently capped at 15 percent are likely to move sharply higher next year for many investors. 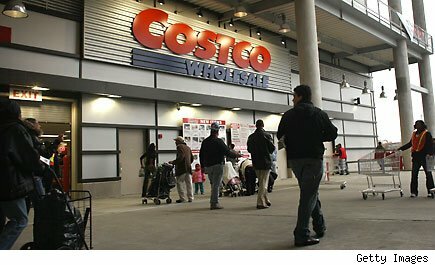 However, Costco's tactic of borrowing the money that it's going to send to its investors was curious. Yes, interest rates are cheap these days, but Costco will be paying the price for this distribution for years. Well, Costco will get a chance to tell its side of the story when it reports its latest quarterly results on Wednesday. 2. A Dollar a Day: Shoppers love bargains, and that shiny nugget of truth has propelled Dollar General (DG) through the darkest recessionary stretches that we have experienced in years. Well, Dollar General will get another shot to show its all-weather ways on Tuesday, when the thrift store retailer posts its fiscal third quarter results. Analysts are expecting another strong showing out of Dollar General. They see the chain posting a profit of $0.60 a share, 20 percent ahead of the $0.50 a share it rang up a year earlier. 3. Zombies to the Rescue: It's apparently never too late to release a video game. Telltale Studios is putting out "The Walking Dead" -- a video game based on the graphic novel that inspired the popular AMC Networks (AMCX) television show of the same name -- on Tuesday. Dec. 11 is a surprisingly late rollout for a game looking to cash in during the pivotal holiday shopping season, but the industry can use any help that it can. Industry tracker NPD Group recently announced that video game industry sales fell 11 percent in November, and that's despite ballyhooed releases of "Call of Duty: Black Ops II," "Halo 4," and "Assassin's Creed III." The release of the Wii U wasn't enough to avoid a double-digit decline in hardware sales. A single Xbox 360 and PS3 game isn't going to change that, but it's a welcome boost late in the year for an industry that's been in zombie-mode itself over the past three years. 4. Home is Where the Recovery Is: It's been a strong year for homebuilders. Real estate developers have bounced back, helped by the combination of low mortgage rates and stable home prices. After several years of declines, home prices have started to move higher, and that's giving potential home buyers the confidence they need to sign on the dotted line for new digs. Hovnanian Enterprises (HOV) is the latest residential builder to report quarterly results. A year ago, Hovnanian posted a sharp deficit of $0.90 a share. This time around, Wall Street's holding out for a much smaller loss of $0.06 a share. Hovnanian has actually posted a profit in each of its two previous quarters, despite analysts calling for red ink. We'll see how this plays out on Thursday, but it should be another redemptive quarter for the once troubled homebuilder. 5. There's a Hobbit Among Us: Peter Jackson transformed "The Lord of the Rings" into a box office trilogy of blockbuster proportions. He's back this week with the first installment of new J.R. Tolkien trilogy with "The Hobbit: An Unexpected Journey." Digging deeper into the canon of Middle-Earth, the new film and its sequels should be big theatrical winners. Multiplex operators will be certainly hoping for success. Movie theaters have struggled with weak ticket sales over the past two years. The year has been picking up steam lately, and now it's up to the final batch of holiday releases to drive the profits home for exhibitors and the movie studios. Motley Fool contributor Rick Munarriz does not own shares in any of the stocks in this article. The Motley Fool owns shares of Costco Wholesale. Motley Fool newsletter services have recommended buying shares of Costco Wholesale.